It’s long been an adventure watching Kendrick Perkins with a basketball in his hands. There have been passes to both empty spaces and opposing players, post ups that went nowhere and mid-range jumpers that barely grazed the rim. Despite those moments, Scott Brooks still likes to involve his starting center in the offense because of all the other good things he does. After all, it’s damaging to have a player on the court who never shoots the ball, and Perkins is already in the bottom-10 in the NBA in field goals attempted per-36-minutes (Steven Adams also, to be fair). Arguably the easiest and most valuable solution would be to not start him. A second, similar solution would be to play him the least possible minutes he’s content with. Both seem to have little to no chance of happening outside of a Finals matchup with Miami, so another alternative is to make halfway-decent lemonade with $9 million worth of lemons. Just where Perkins is best with the ball, though, is tough to answer. He’s usually not quick enough to contribute to fast breaks and has trouble finishing around the rim in general, second-worst among big men with 50 or more attempts within the restricted area. The extra half-second he takes to bend his knees before elevating impacts him the most around that part of the floor, allowing quick-recovering defenders to turn open layups into heavily contested ones. That’s a problem nobody else in the Thunder’s otherwise freakishly athletic rotation seems to have. Another option is post ups, one of the most frequent looks for Perkins even though they’re a shaky choice at best. He’ll often take a second too long to measure up his defender, overthinking the process of scoring. Perk can physically impose his will to a decent spot, one that allows him to use a jump hook that sometimes doesn’t look half-bad but other times appears clunky, but when matched with a player that gives up little ground he’ll attempt a turnaround fadeaway that doesn’t exactly mimic LaMarcus Aldridge‘s. Movement from every other Thunder player often comes to a screeching halt. So what scoring options are left if Perkins has a tough time near the rim, in the post, and from 15 feet? Believe it or not, he’s shown off a floater. It doesn’t exactly mimic Shawn Marion’s, but the floater from the 280-pound center has been an effective way (he’s 10-for-15, according to video from NBA.com) to capitalize on attention Durant draws from multiple defenders. Surely he’d benefit off Russell Westbrook too if he were healthy. Below are a few examples in slideshow format. The floater solves a ton of Perkins’ problems. He takes those shots just outside the restricted area where he struggles mightily, and the extra time he needs to bend his knees and elevate doesn’t pose as much of a problem when he’s catching passes mid-stride. Perk will stop and ready to shoot just outside of a help defender’s reach, though it’s fine if he causes them to contest his shot. Serge Ibaka, the Thunder player whose defender is most likely to rotate, often waits for the offensive rebound. The floater also keeps Perkins free from thinking. It’s similar to what Seth Partnow at Where Offense Happens wrote about Harrison Barnes a few weeks ago, for example. Keep it simple, and Perk does when he goes with the floater. It means he doesn’t pump fake or back his defender down with a series of dribbles, but takes that silky, silky, silky smooth shot before the defense adjusts towards the paint. Like mentioned before, the quick floater by Perkins also gives Ibaka a greater chance at an offensive rebound since there’s one less opponent in the paint. There’s also the realization from the opposition that Perkins is scoring on them. Back in the lockout-shortened 2012 season there was the game between the Timberwolves and Clippers where Kevin Love sank a game-winning three, but before that shot was a series of events that included Darko Milicic banking a floater off the dribble. Hubie Brown called it “demoralizing” for the Clippers. 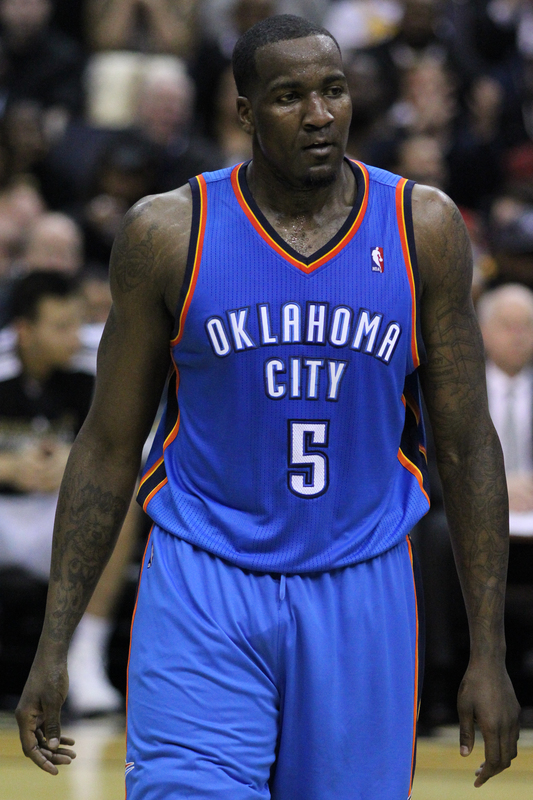 I’d like to it’s the same for anybody beat by the Thunder not because of Durant or Ibaka, but Kendrick Perkins. The sample size is small for that shot, but going 10-for-15 is a nice start. Factored in with the rest of Perkins’ shots from five to nine feet out, he’s one of the best shooters in the league from that area. It won’t turn the world upside down if Oklahoma City gets him more of those looks than post ups (unless you’re netw3rk), but even if the floaters balance out to roughly 50 percent they’re still a two dropping at a similar rate as open mid-range jumpers from Ibaka. It’s also a nice alternative in the playoffs when pace slows down and every scoring option counts. Going forward, whether that unusual shot from Perkins is enough to deflect attention from his flaws is hard to tell. If Scott Brooks continues to designs scoring options of Perkins, hopefully he helps the center become less of a comedic adventure with the basketball in his hands and more of a finisher.